Commenting on this blog is now closed. The posts will remain visible for the time being. For the year, I’ve taken Tae Kwon Do at the dojang where my kids take lessons. It’s been an awesome experience, for me, who has always been unathletic and uncoordinated. I’m now a black and white belt and will be testing for black belt sometime before October. That’s right, people. I’m going to be a black belt!!! Yeah, I’m super excited, but I am also aware that I would never have made it there on my own. I was lucky that started taking classes at the same time as some wonderful other women. We encourage one another and carry one another when we need to. And we lucked into a class with some other great women (all black belts), who are fun and patient with us. One of them is a 68 year old fourth degree black belt! I totally want to be here when I grow up! And, then there’s our instructor, Master Um, who won the world championship in sparring. Watching him is amazing. Just the way he moves. Lightening fast. It’s like watching a movie. You know those fight scenes in movies where the ninja moves so fast you’re sure it’s a special effect? It’s not. He moves like that. He doesn’t spar with us often, but every single time he does, I take a moment to pause. To just watch the way he does things. Not only to marvel, but also to learn. Every day I go to the dojang, I learn so much from the people I work with. I learn about my limits, my capablities. I learn when to be humble and when to proud. When to work harder. I have felt that way about this blog. Every time I come to this blog I learn more about what it means to be a mother. What it means to raise children and grow them into people I want to share the world with. Just being part of this blog has made me raise my game. Just like when I’m in Tae Kwon Do, sometimes I come to this blog and I just stop and marvel. With these women–the ones who visit the blog and the ones who write on it with me–with these women, who are smart and strong and dedicated, with these women raising the next generation, how can we go wrong? Thank you for sharing your lives, your creativity and your children with me. Sometimes I find myself with my kids, and for whatever reason, time just sort of slows down, and the details of the moment overwhelm me. Maybe it’s a smile, a laugh. Maybe it’s the way one of them is running down the soccer field or the fierce determination of a batter’s stance. Or maybe it’s the sound of their voice, or a picture they’ve drawn, the feel of their hand in mine. Or maybe…maybe…it’s not at all. Nothing specific anyway. It’s just the moment, and the raw rightness of it makes me wish I could stay right there in that moment forever. That things could always be like that. That there wouldn’t come a day when they’d grow up and move on with their lives, go off to college…and maybe never come back. That’s what I did. (My husband, too.) I went to college, then went off to find a job…500 miles away. I planned to go back. Louisiana was home. It never occurred to me I’d stay in Dallas. I was a Louisiana girl…not a Texas girl. But here I am, all these years later, still in Texas. Time doesn’t stand still. Things change. Children grow up. That’s life. So instead of spending too much time on the fantasy that certain moments can last forever, I’ve found myself thinking about what can be, instead. What seeds I can plant today, for the most wonderful blossoms possible tomorrow. I can’t freeze time, but maybe, just maybe, I can influence what lies ahead. So I find myself with these wishes, wishes for my children…for my nieces and nephews…my siblings and parents…my friends. For everyone. I wish for you to be heard. For you to always feel like you have someone (or several someones!) who hears you, who gets you. Someone you can lean on—who wants you to lean on them. Who wants to listen. Who likes to listen. To you. I wish for you to feel love. Really feel it. The warmth and security, the unabashed acceptance of who you are, the confidence that comes from knowing you don’t walk through your days alone. I wish for your life to be absolutely flooded with smiles. Your smiles. The smiles of others. I wish for you to feel the freedom to lift your eyes to a total stranger…and smile. And I wish for you to feel the warmth of smiles given to you. Just a smile. Such a simple gesture. But each one has untold power. I wish for you to be true to yourself. Be authentic. Find your passion, and follow your passion. Don’t let anyone else tell you who you should be. Define you. Affect how you think about yourself. YOU are the leading lady (or man) of your own life, the captain of your own ship, the author of your own life story. Own it. Love it. Chase your dreams. Color outside the lines if you want to. Don’t hold back. You are the only you. I wish for you to make the most of each day. Not because you never know what tomorrow may bring, but because each day brims over with its own promise. Don’t worry about tomorrow, not until it becomes today. One moment, one breath at a time. That’s how you see the colors in the rainbow and hear the sound of the birds. And finally, I wish for you to know that even when darkness comes, as it sometimes does, it always passes. Not even the darkest, stormiest night lasts forever. Dawn always comes, and with it a new day. Okay, so that’s six, but I never was very good at math, and that’s okay. I’ll miss Peanut Butter on the Keyboard so very much. I have a heaviness in my heart that this door is closing, but everything in life has its cycle. I’m on just about all the standard social media sites, but I am most active and responsive on my Facebook page: https://www.facebook.com/jenna.mills. I’d love to see you there! For now, I’d like to close by wishing you happiness in all that you do. For a few months now I’ve felt like I didn’t know what to say on the blog. Which is, in part, selfish. I’ve used this blog as occasional therapy to deal with the challenges that come with being a family that doesn’t follow a traditional structure, a multi-racial family with a stay at home dad and special needs children. I field a lot of commentary from people out there in the world, and I’ve used this blog as my mouthpiece from time to time to vent the pain and frustration that comes just from LIVING. I don’t think I’m unique, I think we all have those same challenges, they just take different shapes. We’ve all been hurt by strangers, by well meaning friends, no matter our situation. But I’ve been grateful for this platform, even if I’ve been an unfaithful user of it. So, one more time, I’ll use you as my sounding board. I’m often asked what I think the future will hold. For my family, specifically for my Danger Boy, who has autism. Will he live on his own? Will he be able to have a job? The simple answer answer is this: I don’t know. But here’s the beautiful, freeing, marvelous truth, my friends: Autistic or neurotypical, none of us knows what tomorrow will bring. I can’t see the future. So I look at today. At my eight year old son, who has made leaps and bounds socially over the past few years. Who is interacting more with his peers, and with us, than in the past I’d imagined possible. Oh, the years I spent worrying about what would be. And now we’re here, and it turns out it’s pretty darn beautiful here. I look at my five year old daughter, so perfect where she is right now, right on track developmentally. What a blessing. One I can’t take for granted. Her every word is a miracle to me, because at five neither of my sons could have a conversation with us, and she’s free to fill the silence with her unique perspective of the universe. I look at my husband, who I married ten years ago this May. You guys, he just gets hotter. Today, he’s even better than he was yesterday. Today, I appreciate him more than I ever could have a decade ago when I stood there and promised to love him forever. I didn’t know what our forever would be. If I had? I don’t know if I would have walked forward. Into periods of financial struggle, of worry and fear and tears for our children, of serious illness in the family. Thank God I didn’t know. Thank God I couldn’t see the future, a future I might not have been brave enough for back then. But I’m brave enough now. That’s all we need, really. To be able to weather the storm we’re in, not the ones coming down the road. I’m glad we were brave enough to walk into the unknown then. I’m glad we’re here today. I’m thankful we’re still talking forward together, not knowing what’s ahead. We’ll get through. And if the past is an indicator, we’ll even get through it with a smile. I’ve shared my struggles here, my times of feeling I was walking through the woods without a map. Those times are hard. But I find them especially overwhelming when I’m looking too far ahead, imagining the forest goes on forever. That I’ll be forever lost among the trees. I wasn’t. I’m not. The future wasn’t as scary as I thought it would be. Today is so much more beautiful than I ever could have dreamed. It’s my prayer that I learn to keep my eyes on the present. That I learn to take the future as it comes into the present, rather than whiling my present away, trying to look through the fog and see what lies ahead, worrying, worrying, worrying for the things I can’t predict. Maybe the road ahead is rocky. That’s okay. I’ll navigate it when I get there. And then? Then I’ll be ready. Or I’ll get ready when the time is right, if the past is an indicator. This is my hope for all of you. That you might find beauty in the every day. That we would worry less about what’s on the road ahead. That we would rejoice in the moment we’re in, even if it’s raining. Goodbyes are never easy. At least, not for me. Especially when they’re shared with loved ones, people I’m fond of, places I enjoy being, or blogs to which I feel a connection. I guess you can see where I’m going here. It’s my final blog on the Peanut Butter on the Keyboard site. I haven’t been a PBOK mom for very long, but I’ve enjoyed every minute of it. The camaraderie, the shared insight and advice, the comfort in hearing from other women with similar issues. Whether we have kids or not, have toddlers or adolescents or young adults, whether we’re married or single, whether we’re writers or not… we’re all women, striving to do our best, give our best, be our best… in a world that is ever changing, ever challenging, ever hectic. There are times we want to fix everything, accomplish anything and feel like we’re SuperWoman. And there are moments when we just want to curl up on our couch, cover up with a warm blanket and take a nap. We’ve shared celebrations, tragedies, family traditions, and posts about ideas or organizations or injustices we feel strongly about and staunchly support. We’ve questioned ourselves, our kids, our parenting, our actions—and in return we’ve received guidance, pats on the back, reassurance, tips, “hang-in theres” and commiseration. I’m sad to see our time here come to an end. But the rose-colored-glasses, wide-eyed optimist in me refuses to think of this as “good-bye” but rather “FAREWELL!” Until next time. On the next blog somewhere on the internet. On the bookshelves. At a conference. In the grocery line. In spirit. I wish you and yours a life full of peace, joy, health and love—much much love. So, in the spirit of my musical theatre-loving family, I leave you with a song, a little dance, a little laughter and a fond, fond farewell. If you’d care to share what movie or TV show farewell is your favorite, I’d love to hear it. I watched many sad farewell videos before I selected this one. But seeing as how I prefer to close on a happier until-we-meet-again note, I close with this classic. The drill is always the same. Wash the wound, apply some antibiotic cream, followed by a bandage. Within minutes, the crisis has passed and he’s back outside, running and jumping and doing all those things little kids do. Sometimes he even comes running for ointment and a bandage for a bruise or a growing pain…and the second all is applied, he’s back to his normal happy self. My daughter is another story. She’s eleven. Her scrapes and bruises are no longer of the flesh. Her aches and pains dwell beneath the surface, and they run far deeper. She’s dealing with hot-and-cold friendships and peer pressure, with cool kids and mean girls, hushed whispers and turned backs, fifth grade math and standardized tests, the looming end of (the much loved days of) elementary school and the exciting yet terrifying beginning of middle school. She’s no longer a little girl but she’s not yet a big girl. She doesn’t understand why friends she’s known and played with for years and years suddenly don’t call or include her anymore. She gets hurt when there’s no seat saved for her at the lunch table. Her heart breaks when she finds out about a party everyone was invited to, except her. And I just feel so helpless. Sometimes she’ll come to me; other times I have to figure it out on my own. Sometimes I’ll see a post on Instagram and realize what has happened, hear something from another mom, or simply see the hurt or confusion in her eyes. And the mom in me, the mom who once cleaned and bandages her skinned knees, wants to clean and bandage those wounds, too. But it’s not that simple anymore. Because these wounds are life wounds. I can wipe away her tears and hold her close, stroke her hair. I can give her words of wisdom and tell her about similar situations I ran into when I was a kid, about friendships that went awry and how sometimes people simply grow apart. I can promise her that everything will be okay, that she and her friends will either find their way back to each other or she’ll make knew friends, better friends (which we, as adults, know is true.) But none of that takes away the sting or the devastation of the moment. None of that puts the smile back onto her face. None of that sends her bounding back out to play, like her brother with his ultra-cool Star Wars bandage on his shin. It’s all part of growing up, I know. Perfectly natural. And being there for her, loving her, supporting her, is as important as any ointment or bandage. (It IS the ointment and the bandage.) But as I hold her close and try to absorb as much of her pain as I can, I can’t help but think…skinned knees are a whole lot easier than skinned hearts. 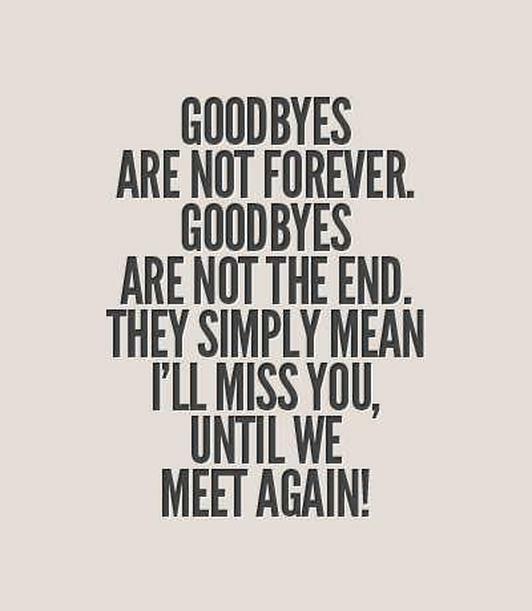 Saying goodbye is never easy. Seeing good things come to an end. Closing doors…sometimes doors we aren’t ready to close. As PBOK prepares to end our run, I find myself flipping through the journal I started two years ago, in which I jot ideas and notes for future blogs. As with so many endings, there’s a lot unsaid/unblogged. But I suppose that’s the way life goes. Taylor is a Beautiful Candidate for Organ Donation, Would You Consider it? 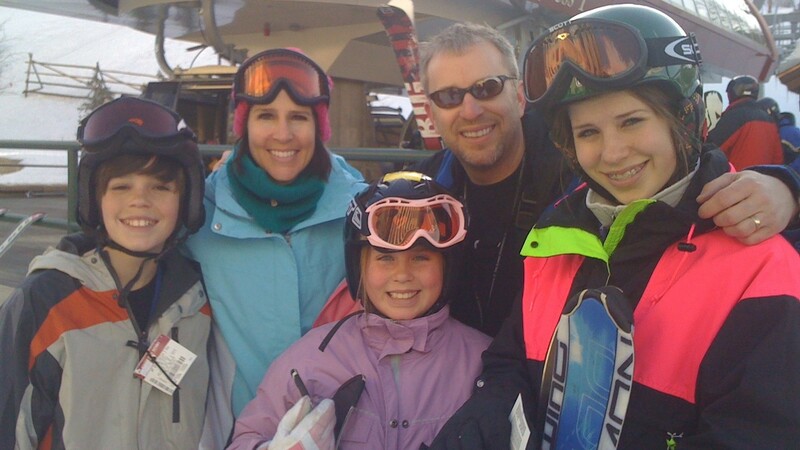 It was March of 2010, on our first day of Spring Break in Colorado when my husband, Todd and I were faced with something we never thought we’d ever face in our lifetime…our oldest daughter Taylor had been in a skiing accident and the doctors told us there was no hope of her surviving. I remember distinctly looking at my husband as he stood by Taylor’s bedside.Immediately we said yes. Taylor was such a giving child that we knew it was the decision she would have chosen for herself, had she been asked. Like most families, we didn’t sit around the dinner table talking about organ donation. In fact, I’m not sure if Todd and I had ever talked about it before that point. We had no interest in talking about our own mortality, much less the mortality of our children. That would never happen to us… So we thought. Looking back at that horrible day, Todd and I have said so many times that it was a privilege to have said yes to that question. Taylor saved and improved the lives of five people. But it wasn’t just the recipients that were affected, it was their families and friends who were also touched by Taylor’s gift of life. To this day, the ripple effect still astounds us. When we returned home from Colorado and slowly tried to pick up the pieces of our lives without our oldest child, Todd started doing some research about organ donation. In our digging, we found out that our great state of Texas had only 2% of registered organ donors. We kept asking why that was, but most importantly how that could be. It immediately sparked a passion and purpose in our hearts – something that to this day we still have no words for other than, we felt like it was God’s calling for us. We had an overwhelming sense of purpose that we knew, somehow, we could make a difference in this world and honor our precious daughter at the same time. Todd’s grandfather told him while he was growing up; “It’s not what happens to you that matters, but how you react to it that does”. Now, don’t read this wrong, of course it mattered to us (and crushed our hearts) to lose our daughter; however, we had a choice. We could either cave up in the grief… or try to find the good. We knew our reaction was going to be important. Taylor’s Gift Foundation was that reaction. It wasn’t by any means easy, but we made the decision to focus on the good that came out of our tragedy – focusing more on God’s purpose for us and less on the pain of our loss. 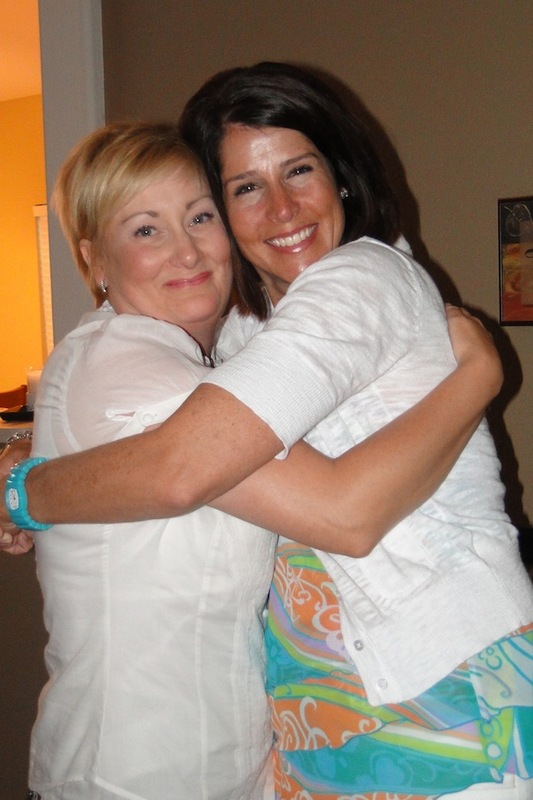 We founded Taylor’s Gift in April 2010 and soon after we met Taylor’s heart recipient, Patricia. The story of us meeting Patricia originally aired on Good Morning America (watch the video), and has since shown up in hundreds of places across the internet, bringing awareness to the Foundation on a global scale. We have been working tirelessly (all by the Grace of God) to increase organ donation registrations across the country and we are proud to say that – with the help of Taylor’s Gift and the help of our peers – our great state of Texas has seen an increase in organ donor registrations by over 630% – with over 5,000,000 new registered organ donors in the Lone Star State. It didn’t take long to notice that donor registrations weren’t the only needs at hand. We recognized that the needs of families who had been touched by organ donation were completely underserved. There were many families who had lost a loved one who gave the gift of life and were suddenly in a position of overwhelming grief and financial stress. For some, the unexpected financial costs from a funeral or losing a bread-winner was completely devastating. Currently we help those families through our Legacy Gift program. 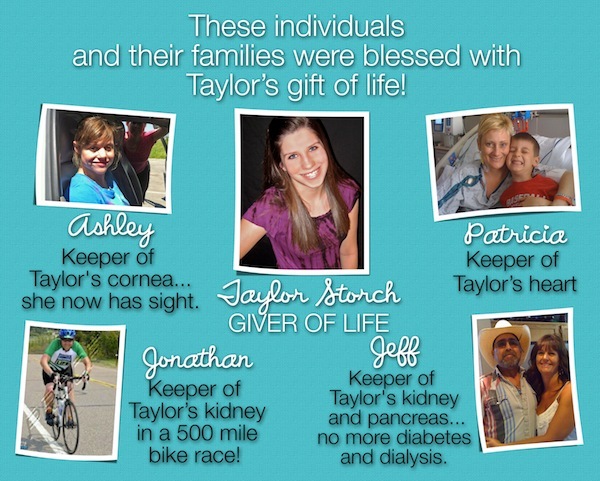 These financial grants have been a life-line for many families and Taylor’s Gift is so honored to help fill this need. I really wish I had words to express what it means to us to give back to families who have given it all… the gift of life. We want to give them some hope. It’s a privilege to help. Just like that day when we were asked if we would donate her organs, looking back on it now, it was a privilege to do so . How Will You Outlive Yourself? In addition to increasing organ donor registrations and being “Here for Tomorrows” through the Legacy Gift program, we at Taylor’s Gift want to encourage an everyday‘Outlive Yourself’ spirit in every person we encounter. Register as an organ donor, strike up a conversation with someone who needs some company, make a contribution to Taylor’s Gift, find a way to give back to your local community… the opportunities are endless. Through acts that are big and small, YOU have the power to Outlive Yourself.